Classrooms are the best launch pads to create a digitally inclusive society. Where technology is adopted, there the development dwells. The Internet, being an epitome of a disruptive technology, touched every walk of life and human endeavor and brought about sweeping changes in the way people lead their lives. Many netizens, who consider it to be a basic social necessity of the present-day society, demand universal access to Internet be included as a fundamental right. In this 21st century knowledge economy, knowledge workers play a predominant role producing ideas, information and solutions, transferring most of the manual tasks to machines. Therefore, making information and knowledge accessible to all sections of society has acquired paramount importance. Against this backdrop, Internet, which is an information superhighway and a treasure house of knowledge, is poised to play a potentially transformative role, which could empower people to operate in this knowledge society. India, in spite of earning a great reputation of being the largest pool of technical human resources and the largest exporter of software services in the emerging world, is struggling to bridge the digital divide that has become a major stumbling block in the progress of the digitally excluded poor and the downtrodden. Though digital divide is argued to be a symptom of poverty and inequality and not the root cause of them, it certainly has the ability to magnify the existing socio-economic disparities. Therefore, the creation of a digitally inclusive society not only provides a level playing field to different sections of the society but also empowers them to unleash their full potential. According to Analysys Mason, a global research firm focusing on telecoms, Indian data tariffs are costlier than even the tariffs in the developed countries, calling for a 75 percent cut in rates to increase usage. This prohibitively expensive nature of Internet access, coupled with highly inadequate broadband infrastructure, is proving to be a major impediment in the path of Internet penetration in India. According to the latest figures, the Internet penetration in India has reached only 35 per cent of the population whereas the same is 53% and 67% in China and Brazil respectively. 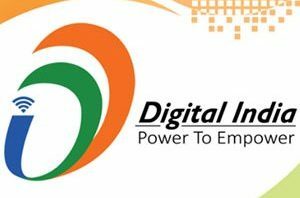 Against this backdrop, the Government of India’s Digital India initiative is a timely and truly commendable exercise, which has the creation of digital infrastructure, delivery of services digitally and digital literacy as its goals. However, considering the distressingly low PC and Internet penetration, the dream of realizing a fully digitally inclusive India is a long way away and will also be arduously slow. Moreover, in a country where around a quarter of the people are still illiterates bringing digital literacy among them is a herculean task. The best way to narrow down the digital divide is to digitally empower the children and the youth, who are the future of the nation. The privileged urban children and the youth, who leverage on the treasure house of knowledge called Internet,gather a lot of information even before they enter their classrooms transforming the role of their teachers from being the sages on the stage to the guides on their side. On the contrary, their rural counterparts still depend hugely on their teachers, who chalk and talk in a vernacular, as their primary source of knowledge. The digitally excluded youth, coupled with their poor English skills, are not able to compete in the job market and remain unemployable. Our politicians and policymakers keep harping on the fact that India, where the median age of the people is just 27 years, has a huge demographic dividend to exploit.Turning children and youth into tech-savvy people will have a force multiplier effect on society and economy. Bringing them onto the digital bandwagon requires a fourfold approach, which includes imparting basic English skills to all the students, providing them with cost effective computing devices, bringing Internet access within their reach and making quality educational content available to be accessed on their devices. Just like everyone who can scribble his signature can’t be graded as a literate, we can’t brand everyone who can give a mouse click as a digitally literate. Digital literacy involves acquiring the ease of use of information and communication tools so that the people can get empowered to operate effectively in this knowledge society. In 2005, a non-profit organization called One Laptop Per Child (OLPD) came into existence with a motive of distributing educational laptops to the underprivileged children in the third world countries. Around 3 million laptops were distributed among the school going children. India, which refused to be part of the OLPD project, embarked on the development of its own $35 tablet PC called Akash. However, both the projects lost steam midway for various reasons and were ultimately shelved. 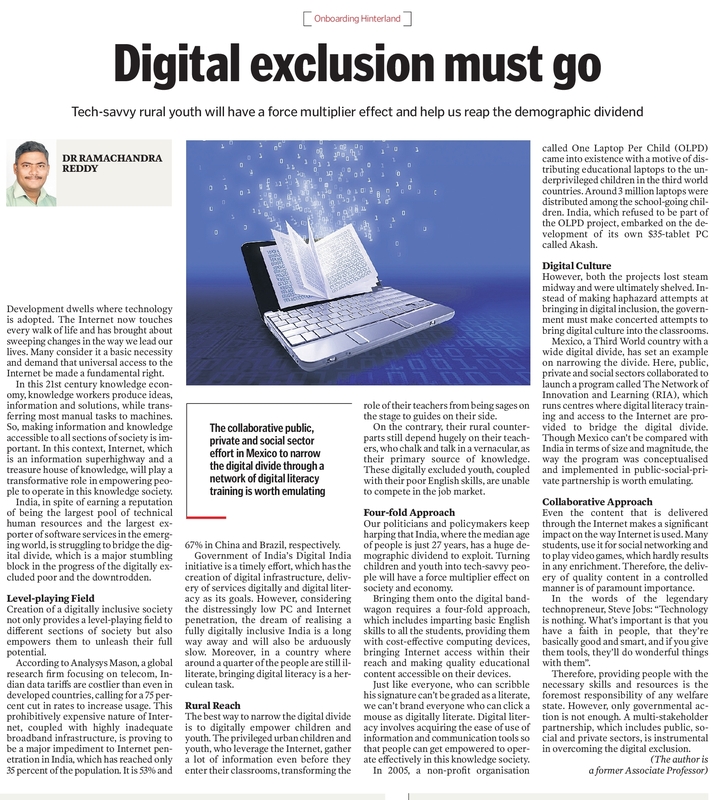 Instead of making haphazard attempts at bringing digital inclusion only to be shelved later,the government must make concerted attempts to bring digital culture into the classrooms. Mexico, a fellow third world country with a wide digital divide, sets an example for others on how to narrow down the divide. In that country public, private and social sectors collaborated to launch a program called The Network of Innovation and Learning (RIA), which runs centers where digital literacy training and access to the Internet are provided with an intention to bridge the digital divide. Though Mexico can’t be compared with India in terms of size and magnitude, the way the program was conceptualized and implemented in public-social-private partnership is worth emulating. Even the content that is delivered through the Internet makes a significant impact on the way Internet is used. Many people, including students, use Internet for social networking and to play video games, which only leads to screen sucking and hardly results in any enrichment among them. Therefore, the delivery of quality content in a controlled manner is also an issue of paramount importance. In the words of the legendary technopreneur, Steve Jobs: “technology is nothing. What’s important is that you have a faith in people, that they’re basically good and smart, and if you give them tools, they’ll do wonderful things with them”. Therefore, providing people with the necessary skills and resources is the foremost responsibility of any welfare state. However, only governmental action is not enough to achieve this. A multi-stakeholder partnership,which includes public, social and private sectors, will definitely prove to be instrumental in overcoming the digital exclusion. This article got published as an opinion column in the editorial page of the English daily, Telangana Today, on 25th Feb 2017. The link to the article is given hereunder. This entry was posted in Society on February 25, 2017 by Dr. Ramachandra Reddy.